← Ta da! The community garden is now blessed and open! 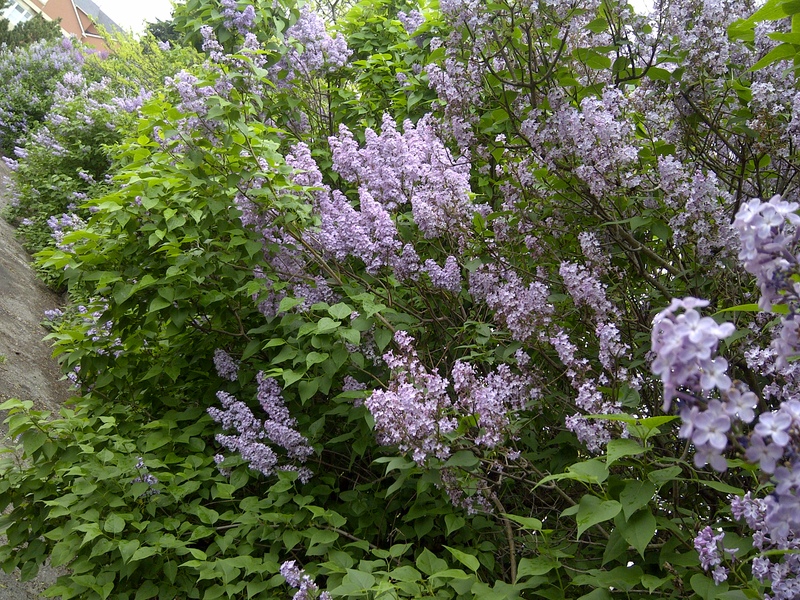 If you drive past the city limits of many Ontario towns, you will see lilac bushes. Some of them are in lovely gardens of course, but many are standing alone in a field or surrounded by a tangle of weeds. They are often all that’s left of a old farmhouse. I was reading a blog this week written by a fourth generation farmer’s wife. She noted the four traditional landscape elements on farms in this part of the world: an apple tree, an asparagus patch, rhubarb, and a lilac bush. They were planted by the people who first cleared and settled the land, building farms and houses. A lilac was planted near the front door for good luck, and because they offered beauty in the midst of challenge and hard work. Since lilacs are long-lived shrubs, they have remained a reminder of our heritage, and are a symbol of the hospitality and hard work found in many early Ontario farm families. When we moved into our house in an Oakville suburb, I was so pleased to find that there was a deep purple lilac beside the gate to the backyard. This land was, after all, the site of a pioneer farm not that many years ago. I added another the first year, choosing a heritage variety instead of the French one already planted. I love that they bloom at different times and in different colours, even if it is a little painful to think about how a beautiful farm was overtaken just to build a subdivision full of cookie-cutter houses. The people who founded my congregation planted lilacs, too, but not just one. They planted a long row of them across the full length of the parking lot. They are more than 20 years old now, and in full bloom this week. The smell is heavenly, and I like to think that they offer our new church building a sense of history. The land on which our church stands was part of a rural farming community at one time, too. 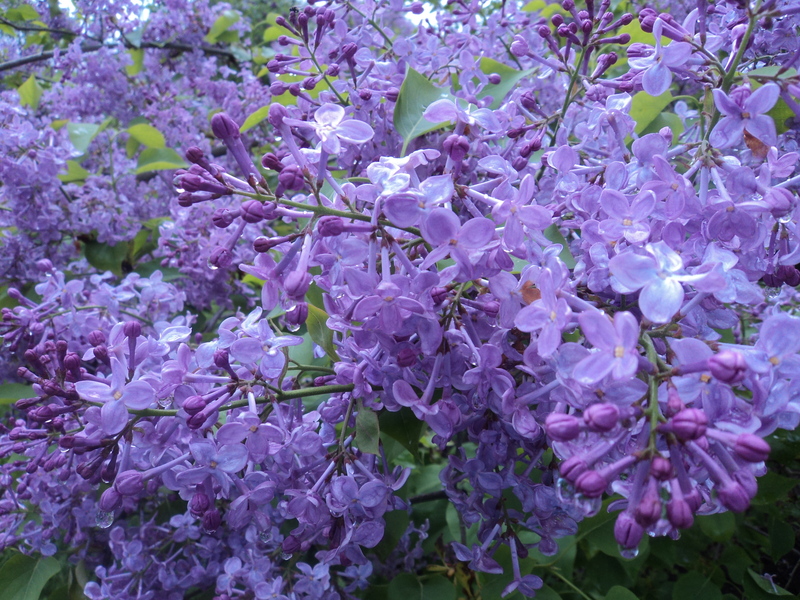 This week I discovered one more fantastic lilac: at the front door to my new house! Although we haven’t moved in yet I like to drive by it when I can. 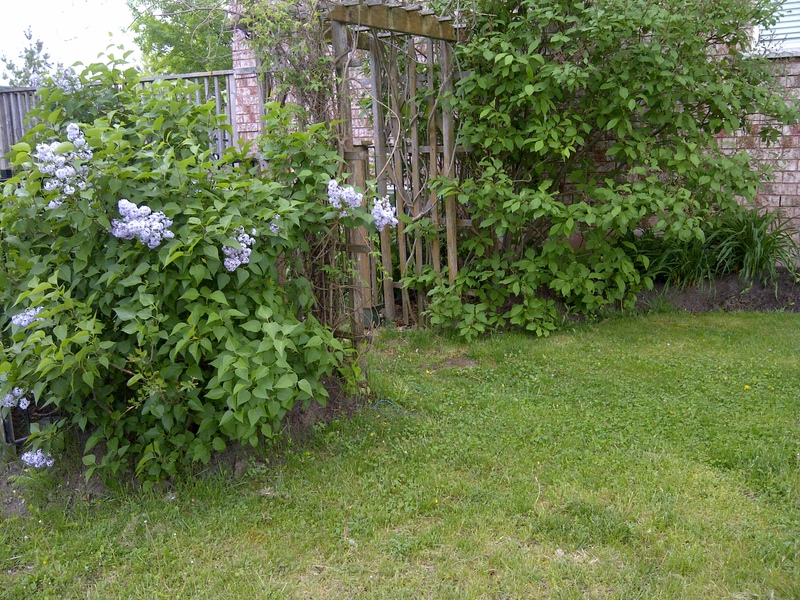 A few days ago, I noticed that there is a tall, old lilac blooming right near the front door. What a lovely symbol of history and hospitality–I feel right at home already. This entry was posted in Uncategorized and tagged church, flowers, home, nature, Oakville. Bookmark the permalink. I’m glad you liked it, Ashlee! Good post! Thanks for the pingback. I love that our ancestors planted Lilacs and they are still around today. Lilacs are past blooming around here, but I just love the fragrance when they are in bloom. Enjoy them! Yes, here in a new subdivision we are awfully didconnected from our roots and I like that the lilacs help remind us of all the people who lived here before we did. thanks for reading! Love lilacs – Two years ago planted three different variations at the back of our Vegie Garden. A deep purple, a white Moscow and an unusual Pink/White – all just babies but blooming finally this year and the scent is awesome. I bet that looks AND smells lovely–how wise you were to plant all three colours!